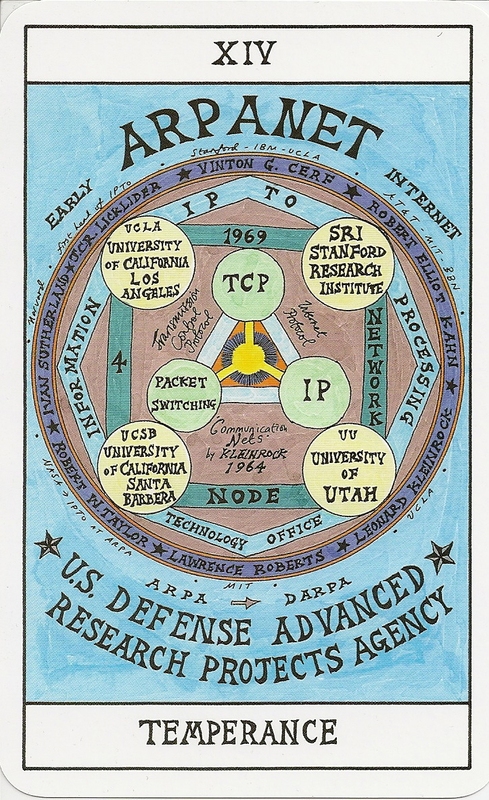 Suzanne Treister’s HEXEN2.0 project is an expansive cross-media investigation into the interwoven histories of government mass control systems, technological and scientific discovery, behavioural theory and countercultural movements, and diverse philosophical, literary and political responses to advances in technology such as the rise of cybernetics and the Internet. 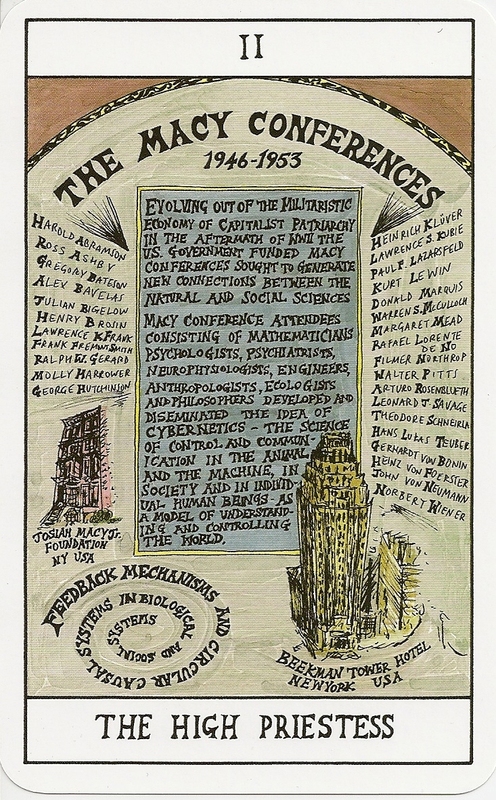 HEXEN2.0 takes as its starting point the seminal Macy Conferences, New York, 1946–53, whose primary goal was to set the foundations for a general science of the workings of the human mind. It is hard to recognize at the first glance, but the basic structure of this deck is traditional tarot such as RWS or Thot. The cards have traditional titles and numbering. The Minor Arcana are split into traditional suits of 14 cards each and consist of: Chalices, Pentacles, Wands and Swords. The Court cards are represented by a mix of individuals, text, organisations and abstract ideas. The cards are big (94 mm x 150 mm). There is no LWB included but there exists a seperate book. 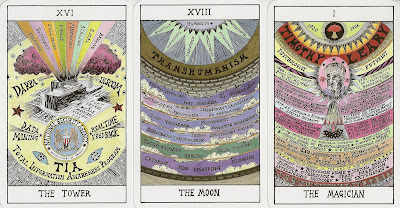 The images are also related to the traditional tarot. For example The Empress. Traditionally she is a mother earth type figure who gives birth to many things. In Treister’s deck she is represented not by herself but by her offspring, namely a plethora of investigative agencies like FBI and CIA. It's not every day that you you get Nikola Tesla, H.P. 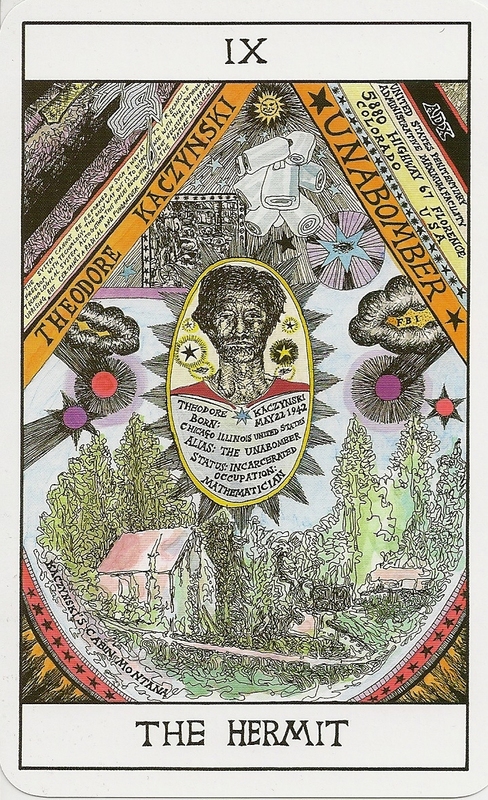 Lovecraft, Jean-Jacques Rousseau, The Unabomber, Ada Lovelace, William Blake, Alan Turing and William Gibson together in the same tarot deck.